Providing Cairo with locally-made, Egyptian cotton products, Zamalek’s Nillens comes as a wonderful breath of fresh air amongst the realm of Cairo’s many bedding and linen shops. Located on the ground floor of the Degla Center on Hassan Sabry Street, Nillens first captivated us with the lovely aroma scent sticks that greet you as you walk in. The shop is relatively small, but very well kept; with smooth colouring and orderly merchandise, welcoming is an understatement. Owner and designer, Nayla Tahan, has worked hard to revive Egyptian handiwork and uses textiles from local manufacturer, El Hesn Textiles, providing dependable products made by Egyptians, for Egyptians. The most common items in Nillens are the bedding accessories. A variety of patterns, colours, sizes and fittings are all available; floral designs, bright colours, as well as more demure palettes, are all in stock. The prices largely depend on bed size, specific sets and thread count – you have the options of 400 and 300 thread count. The most expensive examples teeter the 1000LE price tag, while you can also find sheets for a single bed priced at 250LE; everything else falls in between. 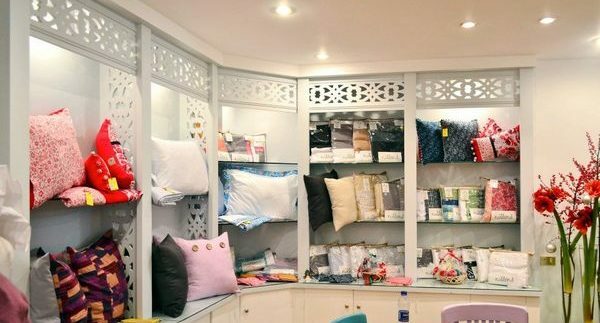 Nillens also supplies other items such as pillows (190LE for large) in a range of colours, comfy loungewear trousers (100LE-135LE), t-shirts (80LE) and fetching pyjamas (120LE) – which come in a lovely cotton pouch in the same pattern. There are also several sizes of ‘kileem’ (60LE-150LE), which are typically lightweight, hand-knotted rugs that come in vibrant colours and are quintessentially Egyptian. The shop offers various other items such as handmade children’s toys that are available either as a stuffed camel or a cat – a small one costs 20LE and a large one 35LE – whose proceeds go to charity. Other miscellaneous items include laundry bags, cosy blankets (450LE) and a few small hand towels available in several colours. The shop’s packaging deserves a mention, too, on account of its quality, aesthetics and most importantly, functionality. We can’t get over the pyjama cases. Nillens provides a neat, efficient experience. The whole shop, along with the products, has evidently been put together with a lot of care. The range of prices vary quite widely, but if there’s something that Nillens proves, it’s that you can find something at a budget without sacrificing quality. Nillens' products are also available in Asfour El Nil in Zamalek, Razzmatazz in Maadi and online at The Giftery. Check out their Facebook page for more. Purely Egyptian, quality bedding items. The location of the shop does it few favours and it's likely to be easily missed.